A short biography of French anarchist militant and historian, Roland Biard. Roland Biard, active militant in the French anarchist movement and then historian of the movement, died at the age of 56, 3 weeks after being diagnosed with cancer. He co-founded the Groupe d'Etudes et Action Anarchiste with Alexandre Skirda (who is also a noted historian of anarchism) when they were both 19. The son of high-up officials in the Stalinist apparatus of the French Communist Party, he broke with his parents' ideas at a very young age. His placid and benign appearance belied his great physical courage. He was at all the anarchist demonstrations against the Algerian war in 1961-2, including the Charonne demo, which ended in the mass lynching of Algerians by the police. 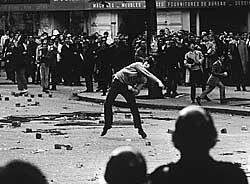 He was also present at the famous night of the barricades on 10th May 1968 in Paris (pictured, above). A partisan of a specifically anarchist communist organisation, he served as secretary of the Union des Groupes Anarchistes Communistes (UGAC) from 1964 to 1966, was co-founder of the Kronstadt group, (which included Daniel Guerin in its ranks) of the Mouvement Communiste Libertaire (MCL), and then joined the Organisation Revolutionnaire Anarchiste in 1971. He left the ORA in 1974, over what he saw as the manoeuvres of certain "charismatic leaders" and the lack of political and organisational maturity of the mass of membership. He devoted himself to writing a series of books including Histoire du Mouvement anarchiste en France 1945-1975 (History of the Anarchist Movement in France 1945-1975) La Commune de Budapest (the Budapest Commune) and his monumental and exhaustive Dictionnaire de l'extreme gauche (Dictionary of the Extreme Left). He published numerous articles, under the pseudonym Julien Stern, or anonymously, in the libertarian press. Teacher, then history professor, he returned to his native and beloved Charente region in 1975. A bon viveur, he welcomed visiting comrades with great fraternity. Faithful to his ideas, he was cremated wrapped in the Black Flag of Anarchy.